If you suffer from sinus pressure the way I do, then you know it’s a nagging winter affliction that you dread at the first snowfall. Sometimes, you feel like finding relief isn’t possible without some form of medication. Sinusitus is the most common chronic illness in the United States, with over 32 million sufferers a year according to CDC estimates. With a multitude of symptoms, ranging from bad breath and headaches to a constant nasal drip, bad sinuses are a force to be reckoned with! Well, it turns out that you don’t necessarily have to resort to medicine for a reprieve. There are natural remedies, including what you eat, that can help. Here are 5 tips that are sure to have you feeling better in no time and without having to pop pills that will leave you feeling dehydrated and maybe jittery. 1. Steam. Dry air can irritate sinuses, so breathing in moisture will help. Getting a humidifier for your bedroom may help. Or next time you are in the shower, inhale through your nose. Or boiling a large pot of water while making dinner, cover your head with a towel and hold your face over it and breathe the steam at least 10 minutes to give yourself a break. 2. Cleanse. 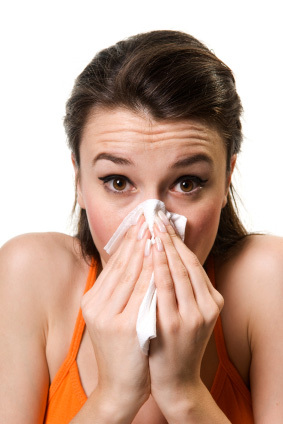 Nasal irrigation, as the experts call it, is one of the most effective ways to clear up your sinuses. It’s not the most pleasant experience, but it really does work. From studying yoga, I discovered the neti pot, a small, teapot-like device specifically designed for flushing out sinuses that you can find at most health stores. I have found that the neti pot is far more effective than a regular saline spray. 3. Spice it Up. Have you ever eaten too much wasabi on your sushi or used too much hot sauce on your eggs? Then you know that heat can certainly clear out your sinuses! So, next time your sinuses are acting up, fix yourself something spicy to eat. Try adding wasabi, horseradish, ginger and turmeric to your diet. Not only will they heat up the nasal passages but many spices contain powerful anti-bacterials. 4. Drink Up. Certain drinks have been proven to help with sinus pressure as well. Try a traditional “fire tea” or Agni tea that many yogis use not only to warm the body but also to calm the appetite. Try drinking a lot of water, as well, to help thin out the mucus. 5. Avoid Certain Foods. Certain foods are known to inflame your sinuses and/or increase mucus production. By avoiding these foods, you could see a difference in your sinus pressure. Foods to avoid include dairy and wheat products and foods high in saturated fat. Try to stay away from these and eat more plant-based proteins, fruits and vegetables. Vegetable soup is a great option. Your sinuses and your waistline will thank you! Learn easy strategies for sneaking in exercise even when you’re not in the mood! Curious about yoga and other yogic practices? Browse my list of favorite yoga texts. Find out where sinus headaches come from. I use my neti pot quite a bit since sinus problems run in my family… Thanks for the source! Hi! Thanks for the help on this website. What I have done in the past that has really helped is I would fill up a small bowl of water, sprinkle some ground ginger in, and then microwave a bowl of water for about 1:45. I would then put a towel over my head and breathe in these fumes! IT FEELS GREAT!